May 22, 2014 by Melanie L.
Think about it. The unofficial kick-off to summertime – prime dating season – is upon us and you’ve been on the prowl longer than you’d like to admit with no prospects to show for it. Ok, so maybe that clown with the twitchy spread-eagle fingers, the buck tooth (not two, just the one), and the inability to look you in the eye approached you – twice. But, I don’t mean him. So you took matters in your own hands. You gathered your courage and went over to some tall drink of water on the other side of the bar only to find out: 1. he’s married; 2. he’s your bestie’s sister’s ex; 3. he’s been arrested (like, last year) for salacious behavior on a college campus; 4. he’s been disbarred for co-mingling funds; 5. he’s a fantasy gamer with costumes to prove it; or 6. he’s just plain fugly close up. Ladies, the ER is full of young, single, intelligent, ambitious, smoking hot residents ripe for the picking. They don’t have time to pee or sleep, let alone date, so they need you to come to them. And, everyone knows you can’t just walk into an ER all healthy-looking and expect to see a doctor. Those people get triaged to the six-hour-wait-list area. No, you need a broken bone, the gorier the better. Let’s face it. You’re hot. Like, super hot. You know it. I know it. And, you know who else knows it? The guys you’re hunting. They know you’re the real deal and they’re intimidated. They usually see you across the room and can never muster the courage to approach you. Maybe they’re worried if they approach, you’ll simply reject them with a quick exit. But, a hottie with a cast and crutches is disarming. You’re a captive audience. They won’t get shot down so easily so they’ll be more likely to approach. Nothing, and I mean nothing, helps diet recidivists stick to a plan more than immobility. With a broken leg, there are no idle trips to the pantry. No more staring blankly at the contents of the fridge until you settle on something to satisfy your boredom. It’s just too damn taxing to summon the effort for anything less than avoiding death by starvation. Watch those pounds melt right off. Every single step is a lower ab crunch. Every. Single. Step. Even if you spend your first few days bed- or couch-bound with your foot elevated, once you are up again, you will find that even a trip to the mailbox will kick your a$$, or abs, rather, into gear. Hello, six pack! You want dates so you need to make yourself available. Your broken leg provides the perfect excuse to get out of work to go on that date! “I need an MRI, I’m sorry I’ll be out on Thursday.” Or maybe, you did go on that first date and it bombed but he wants a second. There’s nothing wrong with a polite, “Sorry, next Saturday is no good. I have a check up scheduled. . . .Yes, my doc has openings on the weekend.” (So what if it’s that ER doc you met at the hospital?) Bonus, you now also have a perfect excuse to get out of Great Aunt Edna’s step-grandson’s graduation. You’re welcome. Disclaimer: All characters appearing in this work are fictitious. Any resemblance to real persons, living or dead, is purely coincidental. Ish. 1. I saw. On the animal planet that the injured ones in a herd are targeted first. You should get plenty of offers. Too bad 73% will come from jackals. 2. At what age is it no longer cool to get that cast signed? 3. I have never gotten a hottie ER doc. That should be a thing. You can check check-in times at ERs online. You should be able to check eye candy quotient too. This is America. Wow, I guess I did it all wrong. I broke my foot (ok not leg) a little over two years ago, my first broken bone at age 48! I was married, so, well, your plan didn’t work out for me. I didn’t realize I should have done it sooner. But the good thing? 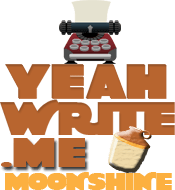 I finally slowed down enough to start my blog (that I’d set up two years prior and never posted on b/c I was too busy). So, it’s good for blogging too. The magic of a broken leg/bone is universal. One woman’s man magnet is another woman’s muse! A healthy way of looking at it, I think. Thanks for the well wishes. My surgery was ten years ago. The healing process took so long, I never got the needed surgery on my other foot. I’m now prone to stress fractures and wouldn’t you know it, just as soon as I posted this to the moonshine grid, I broke the other foot (again). ARRRGH! I don’t know. Folks tell me I am meshugeh so adding a broken leg to the mix would probably truly send me over the edge. But, it could be good for reading time. Refuah shlemah. Yes, forced down time can be made productive in so many ways! Buy one of those wheelie carts that anticipates your every transportation wish by measuring your posture. I forget what they’re called, but you’d be off your feet so less opportunity for stress fractures and guys would have something to talk about still. Everyone looks cool and approachable wearing a safety helmet! Do you mean a segway? I see tourists on those things all the time. They certainly get a lot of attention. Not sure that’s the kind of attention I had been looking for! LOL! Love the blog post! 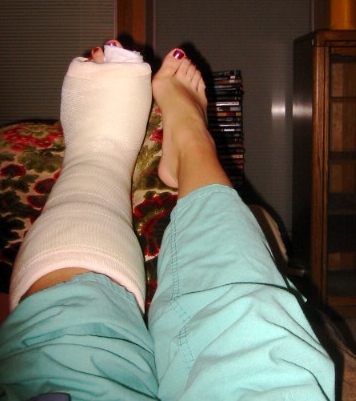 I broke my foot and was in a cast/crutches/wheelchair for 4 months in 2006. Wish I’d read this blog post then! Ugh sorry to hear it! I wish I had written it back then! Well hopefully you never need this advice going forward! Yes thank you! My surgery was back in 2004. The threshold of summer is upon us. Let the dating season begin! Correct! I have a broken leg at the moment. In a cast from thigh to toes and the attention I get is unreal. I’m 25 and consider myself fairly attractive, but recently the guys approaching me are amazing!